Great progress has been made in raising awareness of the importance of public spaces and placemaking, and then getting that importance reflected in the New Urban Agenda. Now we turn to how placemaking can support the implementation of the New Urban Agenda. PPS has spent the last 6 years collaborating with UN Habitat on projects, publications, trainings and many global conferences to make public spaces, public markets, and placemaking a fundamental part of the New Urban Agenda—all topics which had been underrepresented in the global development dialogue until introduced in the 2011 resolution on Public Spaces and the subsequent launch of UN-Habitat’s global public space program. The final draft of the New Urban Agenda mentions "public spaces" ten times! With PPS's global Placemaking Week, and our involvement in Habitat 3, 2016 saw the Placemaking movement go global. As the conversation turns toward the implementation of the New Urban Agenda, placemaking is being seen as an indispensable tool to bring together the many causes and disciplines necessary to making our cities safer (especially for women and girls), more sustainable, more resilient, and more just. 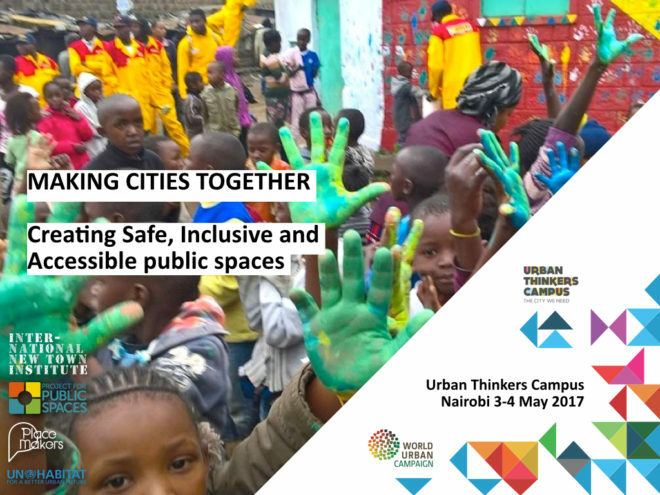 This will be the focus of the Urban Thinkers Campus “Making Cities Together: The City We Need, through Safe, Inclusive, and Accessible Public Spaces”—which will be held May 3-4 at the United Nations Office in Nairobi, Kenya. The conference’s key partners include Project for Public Spaces, the International New Town Institute, UN-Habitat and PlaceMakers, and it has been organized in collaboration with KUWA Urban Spaces by People, and Architects Without Borders (Sweden). Together with moderators and speakers from all over the world, we will consider practical steps forward for implementing the New Urban Agenda through placemaking and public spaces. With a focus on placemaking, the Urban Thinkers Campus (UTC) model is an initiative of UN-Habitat’s World Urban Campaign, conceived in 2014 as an open space for critical exchange, promoting sustainable urbanization across the globe. In order to implement the New Urban Agenda after Habitat III in Quito in 2016, the UTC 2.0 will be action-oriented by focusing on developing action plans and implementable roadmaps for sustainable urban futures. In the “Making Cities Together” Urban Thinkers Campus, the development of public space takes center stage. High quality public spaces are excellent starting points for improving the standards of urban life for all citizens. They are instigators and symbols of important aspects of a city, such as safety, health, and the local economy. Keynote speakers for “Making Cities Together” will include PK Das (Architect, Activist, and 2016 Jane Jacobs Medal recipient); Bulelwa Makalima-Ngewana (Chief Executive Officer at Cape Town Partnership); Ethan Kent (Senior Vice President at Project for Public Spaces); Nadine Bitar, of Placemaking, UAE, Michelle Provoost (Director of the International New Town Institute (INTI) in Almere, the Netherlands); Tatu Gatere, Kounkuey Design Initiative, Kenya, and Nick Langford, of Tatu City, Kenya. This Urban Thinkers Campus offers participants the opportunity to actively engage in dialogues, “Living Labs” and networking sessions. During the Living Labs groups, we will develop action-oriented frameworks regarding the implementation of the New Urban Agenda’s themes on public spaces and participation. Discussions will focus specifically on placemaking, up-scaling & replicating, finance, maintenance and governance in public spaces in communities around the globe. We will also address ways in which you and your organization can contribute to these public space interventions, and how to effectively use placemaking as tool for regenerating and planning in cities worldwide. 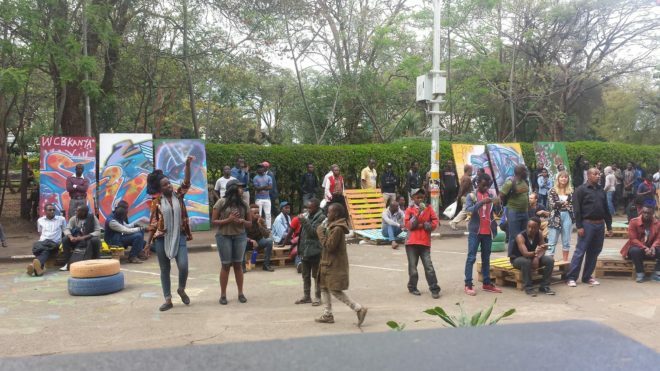 ‍Nairobi has been a leader in Placemaking, hosting their own (now annual) Placemaking Week, and collaborating with PPS on a city-wide public spaces program. The conference is free of charge and invites city makers, city leaders, policy makers, grassroots leaders, students, urban professionals, private sector and citizens to join discussions, knowledge exchange and Living Lab sessions that will turn discussions into practice.